I chose MySQL after looking between MySQL and SQLite for accessing because my iPhone app needs to pull information from an online database that is already in MySQL. I believe the traditional way of accessing information would be: To have a php file on the server that does the accessing for you. The iPhone app would call this php file and it would return the results. 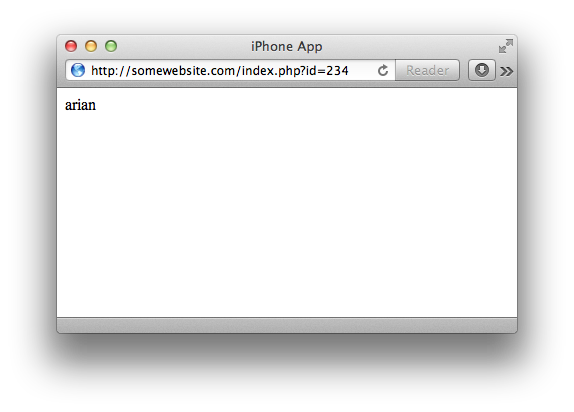 iOS app will call http://somewebsite.com/index.php?id=234 and the website would print out the username of id=234. Now, how secure is this process?... I would obviously use prepared statements and https. But what if someone found the URL for this website? How do I protect myself against misuse (someone could generate a list of all my users)? Is this the standard way to have your iPhone app connect and get info from a database? I would assume the above method would not be safe to do... but I need to be enlightened. Also, I'd prefer to stay away from calling the database within the app using third party API, not supported by Apple. "error" => "Invalid username or password"
Also note that, you should use HTTP response codes in conjunction with this, eg 401 for unauthorised. JSON can use boolean and other data structures within its format. Nearly all major languages have support/libraries for it. The benefits of this is that it allows you to build other applications using the same API such as an android version or an actual website. The main points are make sure to use HTTPS. When sending over user credentials you could return a user token (api key) that can be used for future requests and stored within the iPhone app for future access. Note: This is just a random string typed on the keyboard. This method allows you to delete/regenerate the key if it gets compromised. You can also set rate limiting on the keys and various other parameters. Another huge benefit is by building an API that your own app uses means that it will be maintained to a high standard and other third party companies can also use the API (if you allow them). You should send that sensitive data using POST instead, but any service has to login at some point. Using HTTPS should help the most as it prevents eavesdropping. After the first authentication you can return the token and reap the benefits mentioned above. As for the user login as along as your PHP conforms to good practices you should have no issues. See http://www.phptherightway.com/ it will help a lot if you have questions. Definitely research OAuth and utilize that if you can/want to. This is just a starting point and is NOT meant to be used word for word, further reading and googling is required. If you're looking for an alternative to a "build an API from scratch" approach we've used a web based service called Kumulos available at kumulos.com for a quick and easy solution. This service allows a developer to connect to a MySQL database and build the data model and APIs via a web page then deploy a native library to your platform. I believe you can also import an existing data model as well. Once the data model is built on the web page you can then build APIs and specify input and output parameters. The APIs are modeled based on the type of SQL operation you are performing such as SELECT, UPDATE, INSERT, DELETE. In your case you would want to model a login/authentication UI which accepts the username and (hashed) password, validates the data against the Users table and return the authentication results. Once your APIs are modeled via the web page you can then "deploy" your configuration and generate native libraries for iOS, Android, PHP, and others. The generated Obj C library gets dropped into your project and you make and respond to APIs using objective c calls and delegates. Many mobile applications use APIs to get and store information in servers. Figuring out some of these endpoints is not complicated, and having unsecured endpoints returning sensitive information is a dangerous thing to do. The first level of protection of your API could be to create an "API key" that identifies the application. This key is stored it in the server and checked on every request. Request with no API key should return a HTTP 401 (Unauthorized) status code. API keys are okay, but insufficient when some calls can only be performed by certain users. For example a user needs to update his information, only the owner of the information should be able to perform this call, and not another user. For this you can pass authentication information that identifies the user to perform the update action. I do not recommend using username/password on every request, instead have the user authenticate once, and let the server send back authentication tokens that can be used by the application to perform future authenticated calls. Take a look at OAuth2 as a potential Authorization Framework. Also check out OAuth 2.0 - The Good, the Bad & the Ugly. I suggest using BShaffer OAuth2 Server in PHP. Also see Best Practices for securing a REST API / web service for alternatives. From your question it sounds like there is an existing subsystem, I recommend creating a simple interface that makes the subsystem easier to use, and reusable across multiple clients instead of modifying the subsystem to accommodate an API. This is commonly known as a Facade Design Pattern. Many PHP Frameworks have packages to implement custom RESTlike APIs. Symfony has FOSRestBundle, FuelPHP has a REST controller out of the box and CodeIgniter has a REST server. Create a simple interface to access information from the existing system (a REST API). Protect your private information using a proper authentication mechanism (maybe OAuth2). Use existing libraries and/or frameworks to speedup development. Your code will be reusable across multiple applications and platforms as a result! if you want to access database from IOS Application and save data into database you have to use middleware solutio. Create Web Server In Microsoft ASP dot Net And Access That WebService in IOS Application With that you can communicate between two different OS. return from Webservice is XMLdoucment which can be further parse with xml purser. Not the answer you're looking for? Browse other questions tagged php mysql iphone ios sqlite or ask your own question. Is there an easy way to access a URL in a protected directory?